So many of our Wine Club members and visitors to our tasting room have seen our Blues Cuvée labels and said that we should contact Susan Dysinger whose art they felt would be a perfect addition to our collection. We checked out Susan’s website, gave her a call, and met her at her studio. There she showed us many of her pieces and described in detail the process of etching in aquatint. We were quite impressed and chose “Barrelhouse” for our 2001 & 2002 Blues Cuvée wines. Susan studied drawing and painting at the University of California, Santa Barbara and the State College in Plattsburg, New York. 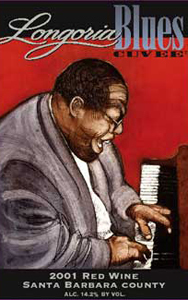 In 1973, she began printmaking at the Laguna Beach School of Art where, combined with her love of music, she created a unique style of etching in aquatint and mono-type that today represents a vivid portrait of American Blues and Jazz musicians. Susan works in her own printmaking studio in Laguna Beach, California. This allows her to maintain complete control over the many steps involved to produce her work. Susan is a long time exhibitor at the annual summer Laguna Beach Festival of Arts and also at the Sawdust Festival.